If you are tired of the same old same old boring chocolate gifts, romance dinner, roses, there’s something new you can try for the upcoming Valentine's Day. We've found some super fun & "EASY" to do, yes I mean easy steps with big visual effect if my kind of DIY projects haha. These DIY love projects will surprise your loved ones and make this year's Valentine's day that much more warmer in the heart & romantic! 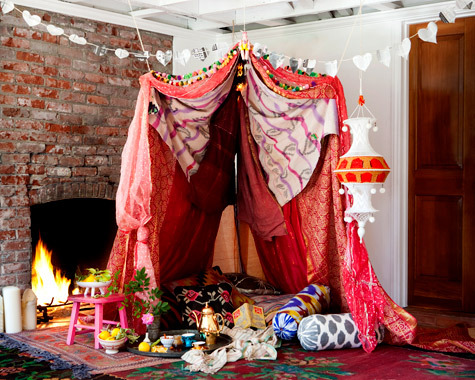 Imagine you & your lover sitting next to the fireplace, cuddling, kissing, drinking champagne & feeding each other chocolate dipped strawberries in a romantic canopy tent you built yourself in your living room .... How romantic is that?! 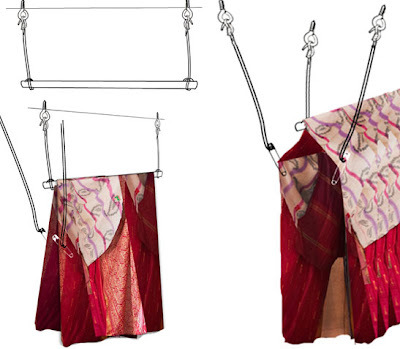 so we've found a easy step by step tutorial by the Lose Angeles based designer Justina Blakeney to show us how. 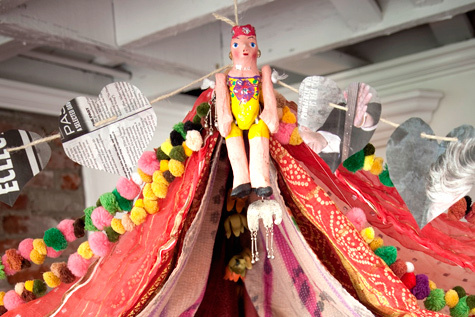 Step 1: You will need 4 screw hooks or S hooks if your ceiling has something you can hang the canopy. 1 spool of twine, and a long stick. 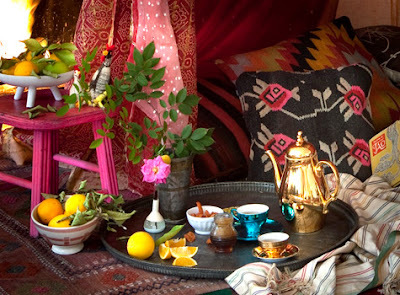 Secure the stick & hang from the ceiling, then Find some beautiful sheets, sarongs or large piece of fabric, in any theme you like to go after, maybe you like the "English Victorian Garden" feel, or Asian Imperial City flair or like in the photo here we are going for the "Bohemian Moroccan" kind look. Drape over the fabrics of your choice and use some safety pins to lift up the front opening as shown in the photo below. 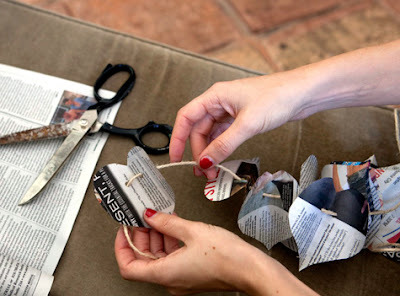 Step 2: Making heart shaped garland by Using the news paper to cut out various sizes of heart shapes or you can buy those heart shaped cake decoration paper, and string through with twine. Step 3: Decorate it the way you want it! 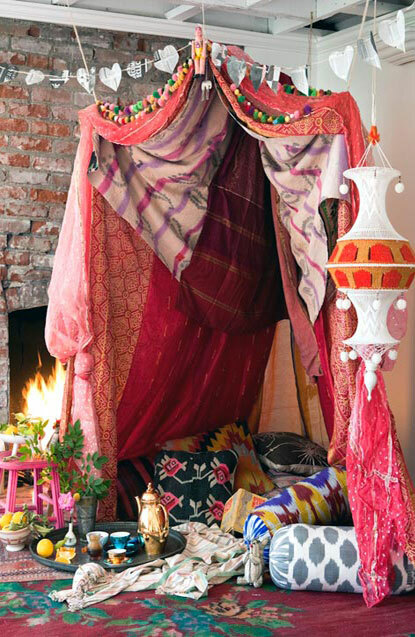 since we're going for the "Bohemian Moroccan" kind look, add some pom poms & any decorations that fits into the theme. Step 4: Don't forget to fill the canopy tent with a lot of fluffy pillows & with some yummy treats! So you two love birds can enjoy an romantic evening cuddling, drinking & nibble on yummy treats! 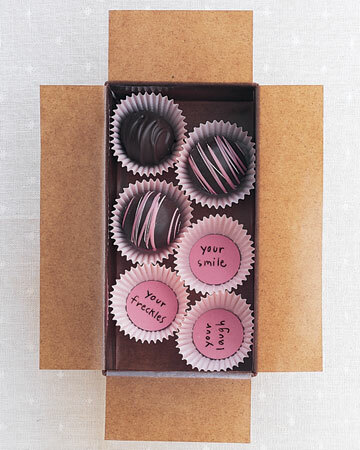 Nothing more romantic to receive a valentine's day gift than something you made it yourself! it's not about how much you spend on the fit, it doesn't have to be a Tiffany's diamond ring (even tho it would be nice! LOL) or a fancy designer handbag. It's the thought and time you put into the gift is what it counts! So if this year, you've decided to surprise your lover with something special & not commercialized gift, here are some easy project or finishing touches you can do to make him/her remember this year's valentine's day! Step 1: Prepare a surface on a work table for hollowing out the bulb. make sure the area is large because little chunks might jump off the base when you crack the glass. 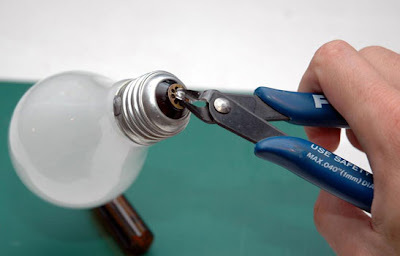 Step 2: Follow these instructions on how to hollow out the light bulb! Click here to see how to do it safely at Teamdroid.com . these are easy to follow instructions that also give good tips on safety and procedure. Step3: When you have your bulb ready, clean the outside carefully and put it to the side somewhere where it is protected from breaking. Step 4: Cut a ten inch piece of wire to make a heart “filament”. fold the wire in half to create a sharp crease, then unfold. about an inch from the crease, take both loose wire ends and loop both wires around to create the heart halves. then pull both wires back down, overlapping the center of the crease and extending beyond the heart shape. 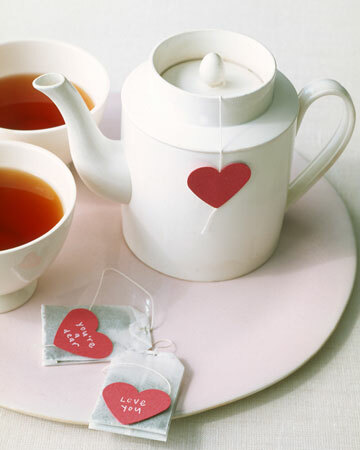 you may want to tweak the heart halves a little to get heart shape that you like. 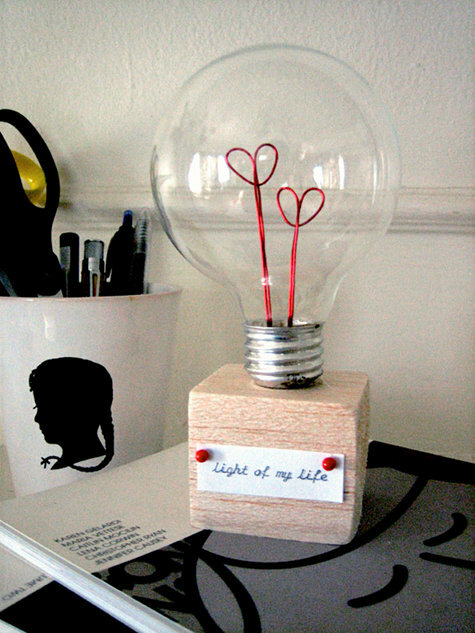 your heart should be about 1/2″ wide so it will fit through the base of the bulb pretty easily. Step 5: If you want two or more heart filaments in your bulb, repeat step 5 one or more times. Step 6: Take your filaments to your bulb and hold them up to see how long the stems need to be to have the heart filaments positioned in roughly the center of the bulb. 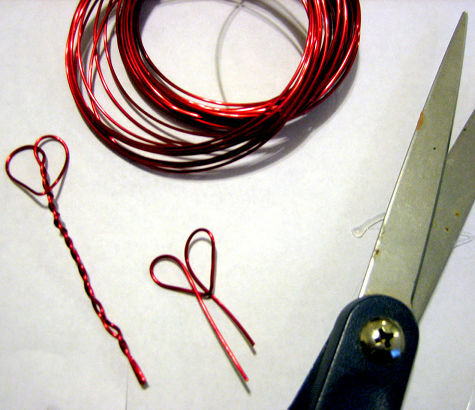 use your pliers to cut the extra wire off the ends. 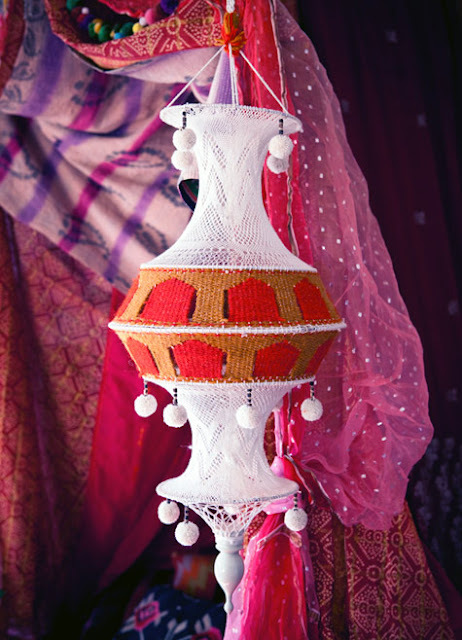 also test that they fit int o your bulb without having to smush them or distort the shapes. if that is the case, make them smaller. Step 7: If your wood is soft, you should be able to poke the wire filaments down into the top of the wood and they will stay in position. if you are using a firmer wood, use a hammer and nail to create a small guide hole. then remove the nail and push the wire down into the hole. you may want to secure these with glue as well. Step8: Now fit your glass bulb over the filaments and glue the bulb down to the wood at the base. 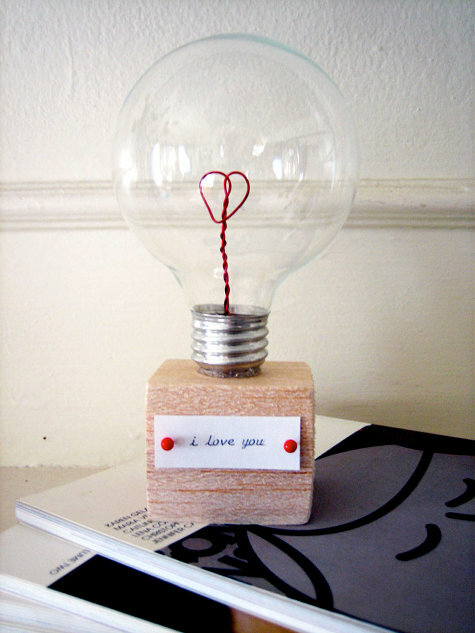 Step9: Use the pins to attach your love note or message to the front of the piece of wood. 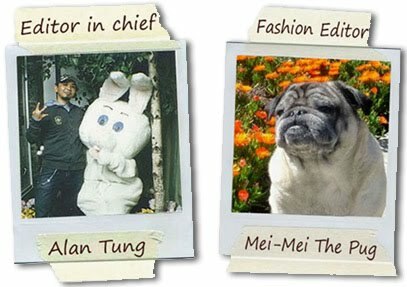 As we the Fashionistas all know, you DO judge a book by it's cover! haha, that's why we love those designer handbags, clothing & accessories, because they pay attention to the details! So why not pay a little more attention to your daily life details on the most romantic day in the year, here are some great ideas for you! If you're giving a box of chocolates or candies as a gift, what A perfect way to remind your lover what about them that make you crazy for him or her by cutting some small paper disks, and place one beneath each candy. On each paper disk, write something what you love about him or her that makes you head over heels. Are you feeling soft-hearted this Valentine's Day? 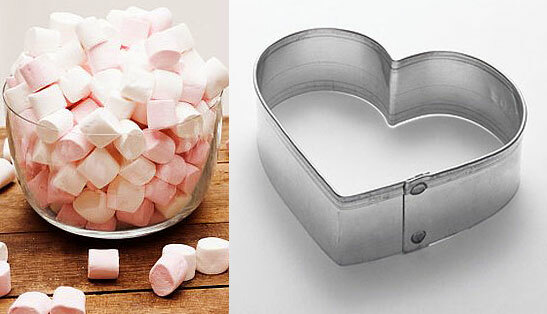 Reach for some marshmallows and transform them into confections of affection. Start by greasing a small size heart-shaped cookie cutter or aspic cutter with vegetable oil or cooking spray. Cut several large size marshmallows in half horizontally, and then press the cutter into the center of each one. 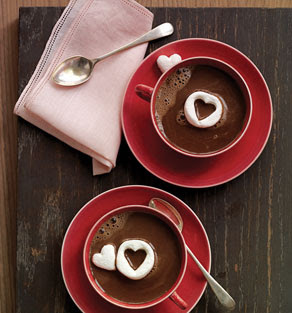 Float the marshmallows and the cutouts on hot chocolate. After all the decorations, candies, cup of hot coco, a nice handmade Valentine's Day card would definitely adds the perfect fiishing touch! 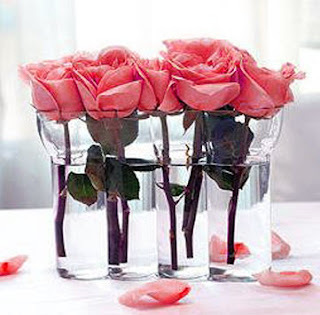 So, after seeing some ideas we've provided in this Valentine's Day DIY special posting, do you feel like rolling up your sleeves and making something special for your lover? Just put a little thought into it, think about what's the special quality of your love that make him or her special and be creative! 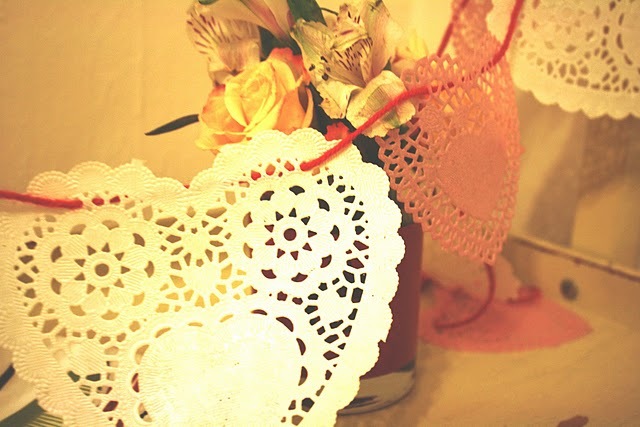 Then I am sure you will come up with something fabulous to surprise & warm your lover's heart this Valentine's Day! Don't forget to check out our Fashionistas Daily Top 10 Romantic Movie Review ! Click the photo below to see our special report !